Nervous system plays a very prominent role in our body; it regulates our senses and keeps us and our brain in a normal state. Nervous system is the network which is widespread in our entire body, which assists our various organs to communicate with each other and if any complications occur in conveying of a message this leads to Neurological disorders that steal away our senses. This is more devastating than a disconnection of a phone line while you are talking to your loved one. Normal functioning of the nervous system is very vital for human survival, though the brain and spinal cord are surrounded by tough membrane packed in the bones of the skull and the vertebrae, the nerves lie deep under our skin and are prone to electrochemical and structural imbalances. The causes vary by disorders and by individual cases but genetic disorders congenital abnormalities, injuries, lifestyle and environmental factors cannot be avoided. Delhi Physio provides the best Physiotherapy treatments that have the potential to heal a wide range of neurological ailments. Our experts with their years of experience and dedication, study various neurological symptoms of the patients after which they begin with the treatment which is refined to your needs. The physical therapy healing totally relies on the condition of the patient and the symptoms which will ensure about the physical potentials that can be achieved. Our neurological treatment offers various treatments such as Mobility treatment, Muscle, Functional, Spasticity, Sensory and Fatigue Treatment. 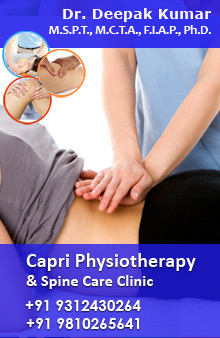 Delhi Physio is the best in treating its patients and offering them a life free of ailments.